YellowAirplane.com: Russian Military MiG-19 Farmer Jet Fighter Models, Plastic Model Kits, Diecast Model Aircraft. Russian Military MiG-19 Farmer Jet Fighter Models, Plastic Model Kits, Diecast Model Aircraft. 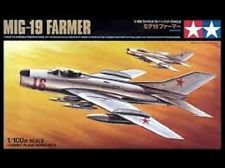 Plastic Model Kits and Die Cast Models of the MiG-19 Farmer Russian Fighter. Also MiG-19 Books and DVD Videos. Russian Fighter Jets Model Kits Department. Russian Military Weapons, The MiG-19 Farmer Jet Fighter, Plastic Model Kits, Diecast Models, Books and More. The "Mikoyan OKB", was founded in 1939 on Leningradskiy Shassi (highway) with a series of buildings and a small factory for use in building prototypes. The OKB was at first, as the title implies, strictly an R&D facility that built prototypes. The Mikoyan flight test center is located at Zhukovskiy (called Ramenskoye, or abbreviated "RAM" by western intelligence and used in the intelligence designation of new aircraft such as "RAM-K", "RAM-J", etc.) and at Volga, on the Crimean peninsula, and other facilities on a temporary basis. There has always been the question of why did the US intelligence organizations recognize Ramenskoye as the name of the test facility when the Russians have always addressed it as Zhukovskiy. When the facility first opened the town of Ramenskoye was the nearest population center. There was a worker's construction camp, named Zhukovskiy, that eventually grew into a larger town and became the nearest population center and official Russian name for the facility. The Soviet Union's First Production Supersonic Fighter. Gordon. Appearing in the 1950s and produced by the thousands, the MiG-19 represented a technological leap as one of the first fighters capable of accommodating air-to-air missiles, a ground intercept system and other advances. Featuring previously unpublished data and photos from original Russian sources, this book examines all of the variants. 160 pgs., 200 B&W and color photos, color illustrations, line drawings and more. 8"x 11", sfbd. Arab MiG-19 & MiG-21 Units. Nicolle. The MiG-21 provided the backbone of frontline Egyptian, Syrian and Iraqi air combat strength for many years and was the Arabs' best hope for challenging Israeli air supremacy. Combining material from official sources, private collections and interviews, this is a detailed history that also includes numerous previously unpublished photos. 96 pgs., 99 B&W and 6 color photos, 39 color profiles, line drawings and more. 7"x 9", sfbd. MiG-17 & MiG-19 Units Vietnam. Combat Aircraft Vol. 25.Toperczer. Book reveals how the Vietnamese Peoples' Air Force (VPAF) grew from an ill-organized rabble of poorly trained pilots flying antiquated communist aircraft into a highly effective fighting force able to hold its own over the skies of North Vietnam. Flying Soviet fighters like the MiG-17 and -19, the VPAF produced over a dozen aces. 96 pages, 40 color and 100 B&W photographs, 7"x 9", softcover. Stan Stokes. An Air Force F-4 encounters a MiG-19 in a close encounter of the wrong kind in this highly detailed depiction. The F-4 Phantom has had a very long life, with more than 5,000 aircraft produced, and many still in service around the world. 16"x 11" signed and numbered limited edition print. Belyakov & Marmain. The Wests first look at this secret Russian design bureau describes every MIG version since 1941, including todays front-line models. Details the mistakes and dead ends as well as the innovations and triumphs. 496 pgs., 334 photos, 6"x9", hdbd. Stapfer. Design history and combat record of the MiG-19, the first mass-produced supersonic fighter in the world. Compared to its American contemporary, the F-100 Super Sabre, the MiG-19 possessed advantages in rate of climb, level speed and landing characteristics. Nevertheless, it served only an interim role due to the rapid development, on both sides of the Iron Curtain, of Mach 2 fighters. 57 pgs., 100 photos, 3-view drawings and 10 color profiles. 11"x 8", sfbd.